Very aerial, white globular mass of this very rare calcium iron phosphate, not cited from Rapid Creek before. 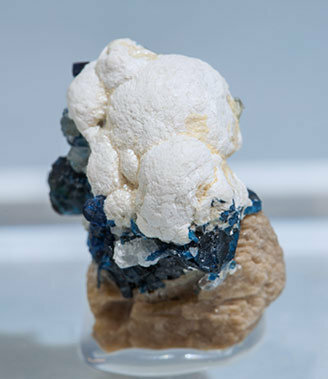 The Mitridadite is on a matrix with a single Whiteite-(CaFeMg) crystal, twinned Lazulite crystals and small Quartz crystals. The sample has been analyzed and we’ll send a copy of the analysis to the buyer.